1. Dilute gelatin in 150 ml of hot water. Leave to cool down. 2. Dilute according to instructions, jelly 300 ml of hot water. Also let it run cold. 3. Cracker broken in half. You can take other crackers (chocolate, soft), then to smash finely. 4. Cut into slices of an orange. Spread on the bottom of the pot the orange and pour jelly. Let them cool in the fridge. 5. In a bowl or a pan pour the cream, add sugar, vanilla sugar and whisk thoroughly. When the mixture is churned, add the cooled gelatin and whisk again. 6. In a bowl with sour cream, add the cracker. Thoroughly kneaded. 7. 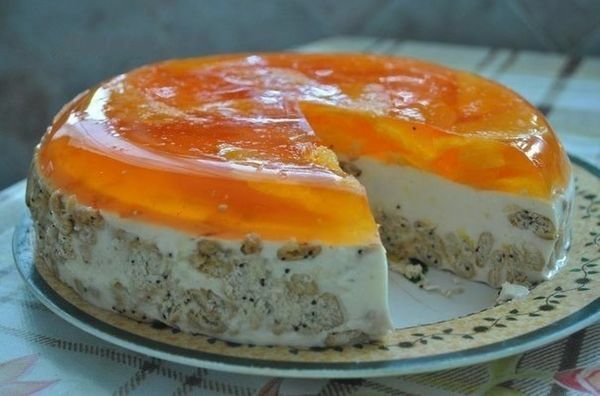 Sour cream pour thickened jello with orange. Put in the fridge to full hardening. 8. Retrieved the cake from the pan to the dish. For a few seconds put the saucepan in a bowl of hot water to the jelly has melted. And turn on the dish. A cake can be done in a separable form for baking. Then the first layer of sour cream, pour, then pour the fruit and pour over the gelatin.